The 7th annual Yuengling Light Lager Jogger 5k starts and finishes at America’s Oldest b=Brewery in Pottsville, PA. All participants will receive a Yuengling Light Lager Jogger branded pint glass, official race t-shirt, two free Yuengling Light Lagers (21+) and admission to the post-race party. The Gift Shop will be open 9:30am -7:30pm on Thursday, April 26th, with free brewery tours starting at 10am until 5:30pm. On Saturday, April 27th the Gift Shop & Tasting Room will be open from 8am – 5pm; no brewery tours. Be sure to stick around after the race for live music, food, and the Operation Gratitude letter writing station, plus so much more! 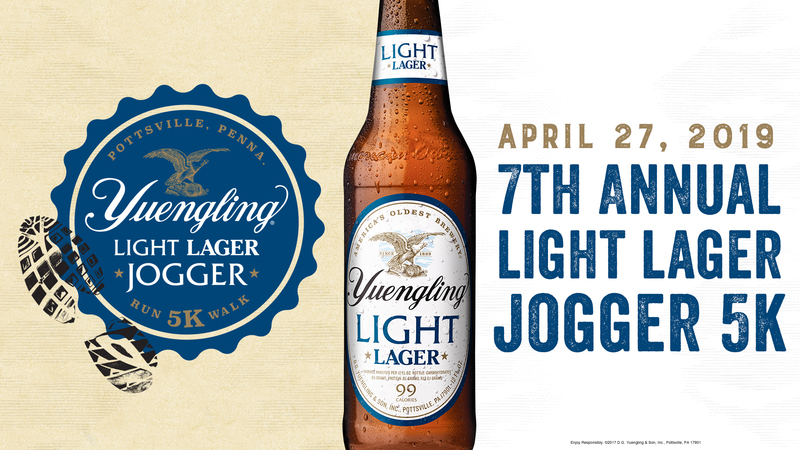 Visit the Light Lager Jogger Facebook page for more info. The race is limited to 3,500 participants and is currently sold out. There is a waitlist.